Superb quality soul band presented as 5 or 10 musicians. Ideal for wedding receptions, festivals, outdoor events, bars, pubs and clubs; retro and 1970's theme parties, conference dinner entertainment, corporate or private functions and events or whenever you need a BIG SOUND. Bump City’s energy and passion exploded on the stage for a live audience of over 600 people at their debut at the “Bundeena Art of Living Festival”. Since this performance people have been talking about the high level of excitement, professionalism and musicianship that exudes from the band. 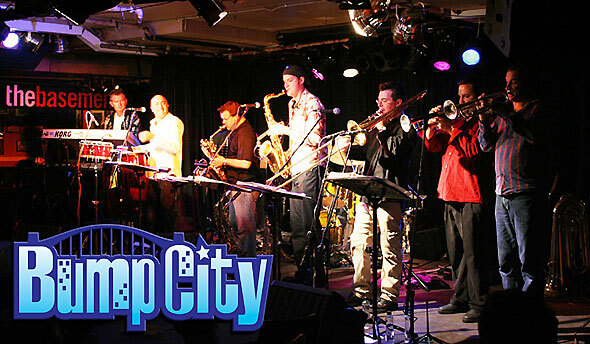 Bump City was formed specifically to perform the soul music of Tower of Power and other great classic artists such as Stevie Wonder, James Brown, Blood Sweat and Tears, Chicago and Earth Wind and Fire. The band’s line up includes: Rod James, drums; Justin Dileo, bass; Vince Lombardo, guitar and Richie Henson, keyboards. Featuring a powerful horn section, and recently performing with the Allniters on the UB40 Australian tour: Grant Metcalfe, baritone and alto sax; Gary Honor, tenor sax, alto sax and flute; Steve Luke, trombone; Tom McElvogue and Andrew “Lucky” Hansch, trumpets and Peter Morgan, vocals and percussion. Front man for Bump City, Peter Morgan has been an established and well respected part of the Australian and New Zealand music industry for many years. With a unique soulful vocal style, his achievements are exciting, diverse and numerous. He has toured with international stars Randy Crawford, Rene Geyer, bass virtuoso Jeff Berlin and performed as the opening solo artist for The Pointer Sisters. Peter presents a great duo with lead Saxophonist Gary Honor called Soul Obsession for smaller occasions. Bump City is available for music festivals, corporate functions and hotel and club gigs. Their dynamic, soulful and funky repertoire makes Bump City a must see!